Habitat: Rainbow Trout can be found in streams, dams, and flowing rivers. They prefer colder water and breed in flowing water systems. There are a number of trout farms in South Africa where keen anglers can fish. Bait: Will accept a variety of baits such as crabs, frogs, worms, smaller fish and lizards in nature. There are specific flys and lures that can be purchased to target trout. Description: Rainbow Trout are long, bullet shaped fish with small scales. As the name suggests, their colouring is amazing with a wide spectrum of colours. They have sharp teeth and males are normally larger. Fishing Strategy: Breeding season is between June and September. 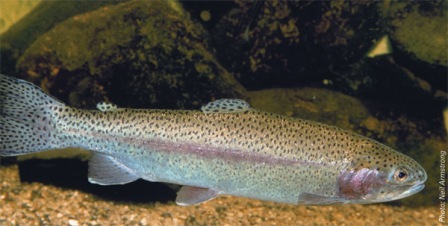 It is not recommended to fish for trout during breeding season as females filled with eggs will be caught and stressed. Trout breed in flowing water and eggs released in still water will die. A small - medium hook.